The fact is that while you might occasionally encounter such trivia, it’s up to you who you follow, so you don’t have to get that sort of stuff in your timeline. You’ll find that, as Mark Carrigan says “the academic Twittersphere (for lack of a better term) is a relatively self-enclosed ecosystem”. This is the image problem that Twitter has with a lot of academic staff – they just don’t see the point. I do sense a switch in this attitude though, as more and more academics start to use it, and they see their peers using it, and their students, and their institutions. What they will find, once they dip their toes is that it is an incredibly useful medium for teaching, learning and research. Equality of access for students – not everyone can, or will join Twitter. You need to provide some sort of access for these students, such as embedding a Twitter feed in a VLE, web page or blog. Risks to personal and institutional reputation from injudicious tweets. It can lead to the oversimplification of debates. Some researchers have crowdsourced funding. In addition to information gathering, you can ask for observations, ask for people to do data analysis, transcribe or edit documents. You can also use Twitter to ask for guest blog posts to build up your network and increase interest in your research. Twitter is also a good way to keep up with news in your field by following prominent figures. Tweet reminders for coursework, or seminars. Ask questions for seminars and tutorials. Give links to readings and research. Encourage students to follow experts and increase their own networks. Tweet a summary of an article or argument. Tweet in a foreign language. Tweet as an historical character. Highly tweeted articles are 11 times more likely more likely to be highly cited than less tweeted articles. Students are more engaged with the course content, the teacher, other students, and they have higher grades when using Twitter. Can Twitter open up a new space for learning, teaching and thinking? The London School of Economics have produced a useful guide for using Twitter in university research, teaching and impact activities. Using Twitter (and other social media) improves desirable networking and collaboration skills. It also increases students’ digital literacy skills. 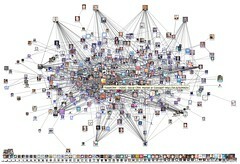 This shows what Twitter is really about – networks and networking. Those thousands of lines represent the interactions between hundreds of different Twitter users. Each of whom is discussing and disseminating information and ideas. 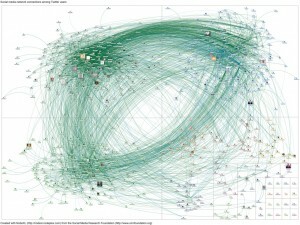 When you tweet your research paper, or proposal, or blog post, this is the network it is joining. Whenever anyone asks what use is Twitter – it’s worth remembering this image. Stephen is an Educational Development Adviser with the Leicester Learning Institute and works closely with colleagues across the university to provide a range of support and training services.